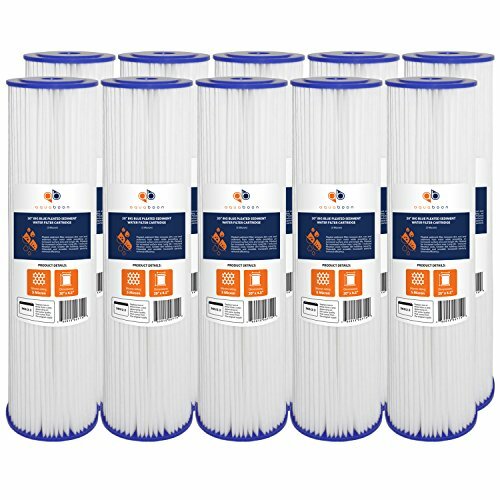 Pleated Sediment Filter Cartridge outperforms wound, spun, melt blown, resin bonded and other "depth" type filter elements because this cartridge is pleated, it provides increased surface area and longer filter life. Lower pressure drop is another significant advantage of using pleated filter cartridge, which allows for increased flow rates and the use of smaller filter housing to reduce capital equipment costs. Additional savings are provided because cartridge is made with 100% synthetic filter media. A good pleated filter cartridge will outperform other types of cartridges because the filter media is systematically produced using 100% synthetic fibers, with no binders or additives to leave a residue or contaminants. Pleated cartridge provides "depth" filtration for greater sediment removal, along with more surface area. • Dimensions: 20" x 4.5"
• Lifetime: Replace two or three times a year, depending on the water quality that comes from the original supply. INCREASES SURFACE AREA. LOWER PRESSURE DROP.